It’s hard to beat a good sandwich, isn’t it? Some people like tuna or egg salad. Some reach for a PB&J, a BLT or a grilled cheese. All are great, but let’s not forget the sometimes overlooked pimento cheese sammy. In my book, a really good homemade pimento cheese made with great cheddar and roasted piquillo peppers is hard to beat. Let’s break one down. It starts with a great cheese. In this case, my favorite – Tillamook Cheddar. Medium or sharp, it needs to have great flavor. 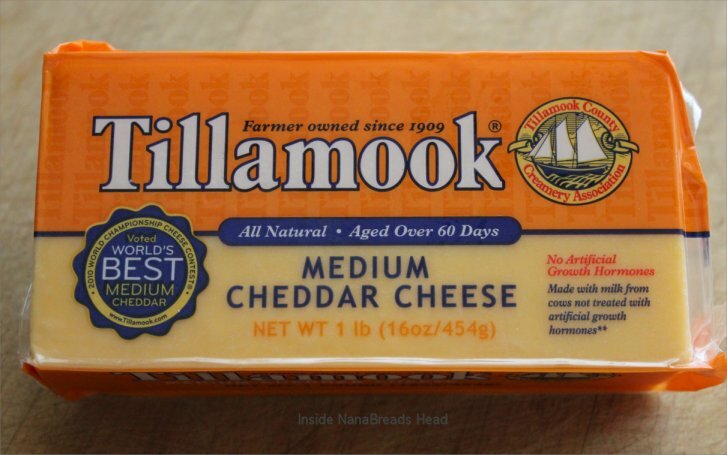 Oh, Tillamook Cheese… how I adore you. If you have a food processor with a grater blade, grating the cheese happens in mere seconds. No fooling. You only need 6 ounces to make two good-sized sandwiches. 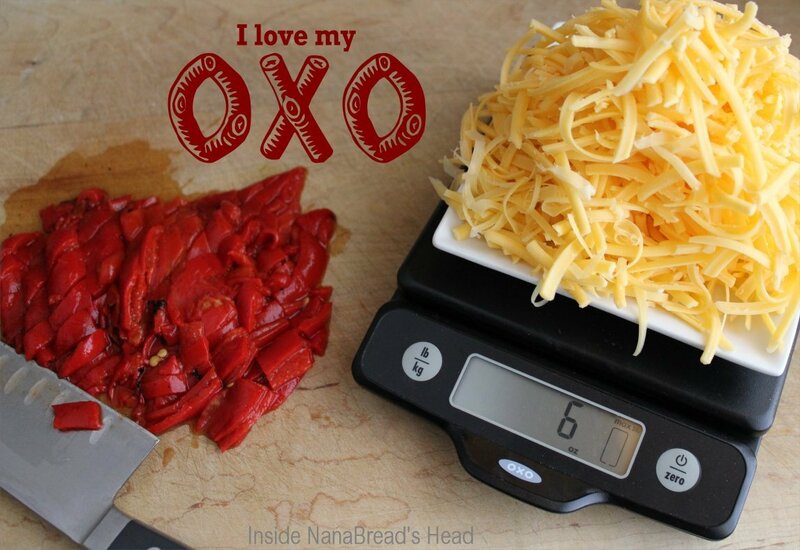 Which gives me an excuse to show off one of my favorite kitchen gadgets, my OXO food scale. This little guy is awesome. I’m using it with the digital reader in its ‘parked’ position, but if you’re trying to weigh something larger, it pulls out about 3″ so you can still see it even when using a larger container. Very cool. Just set your empty bowl or plate on the scale and hit ‘zero’ to clear the weight of the plate off, then add enough cheese to hit six ounces. Next, grab jar of these gorgeous DeLallo grilled piquillo peppers. No cheap pimentos here, kids. Trust me – these piquillo peppers will rock your world. I love their rich roasted flavor and that they’re packed in water, not vinegar. They are robust and so much better than those small jars of brined pimentos. For this, five or six of these beauties will do nicely. In a mixing bowl, combine the grated cheese, chopped peppers and 1/4 cup of mayonnaise (we’re a Hellman’s house). Toss in a pinch of kosher salt and 1/4 teaspoon of coarse ground black pepper. Stir until well blended, then cover it tightly and let it sit in the fridge for about 20-30 minutes. After that, the only decision left is which bread to use, whether to toast it, and what to top it with. We like a good oat nut wheat bread. It’s so darned tasty. I love mine plain; he likes his with add-ons. A pickle on the side gets an A+ too. Mmm… so good. So creamy. So cheesy. And those piquillo peppers? I could kiss them. 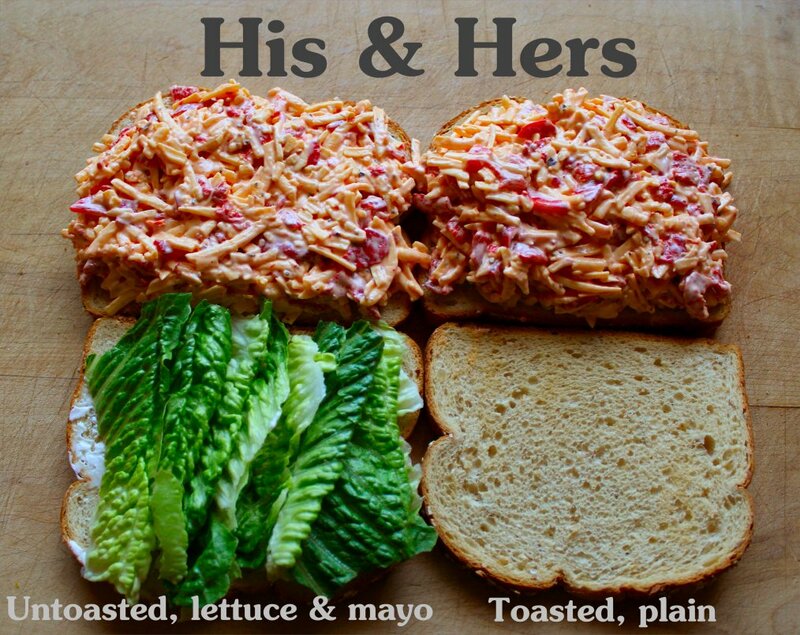 So, share time… do you like pimento cheese or do you reach for that BLT? Are you a grilled cheese & tomato soup guy/gal or do you prefer a good tuna or egg salad? Let’s talk sammies. And GO! Note: I’m aware this post sounds like an advertisement for certain brands, but I swear it’s not. The post was not sponsored in any way by Tillamook Cheese, OXO or DeLallo Foods. These are products I love and use frequently; they just all came together beautifully for this post. All opinions are my own and are shared without influence from the companies shown. I promise. Yet another Southern delicacy that I must try. What’s not to love about cheese and roasted red peppers? Pardon my Northern ignorance, but can you grill a pimento cheese sandwich, or are they best served cold? I’ve always known pimento cheese sandwiches to be served cold, which is why it never crossed my mind to grill it until you mentioned it. I would assume this would make an excellent grilled cheese, but I would omit most of the mayonnaise and use only enough to make it stick together. Something about hot mayonnaise gives me the heebie jeebies. If you try it let me know how it turns out. And if you can’t find the peppers, let me know and I’ll add a jar to your next flat-rate box of goodies. Yum! I add a little onion powder to mine, yummy yummy yummy!!! I like it on plain wheat, or toasted or on crackers…..oh the possibilities! I love it on saltines, too. Rolled in a flour tortilla is also great – pimento cheese pinwheels. So good. I’m just catching up on my reading but I’m afraid it’s making me hungry. Not a good thing at 11PM! 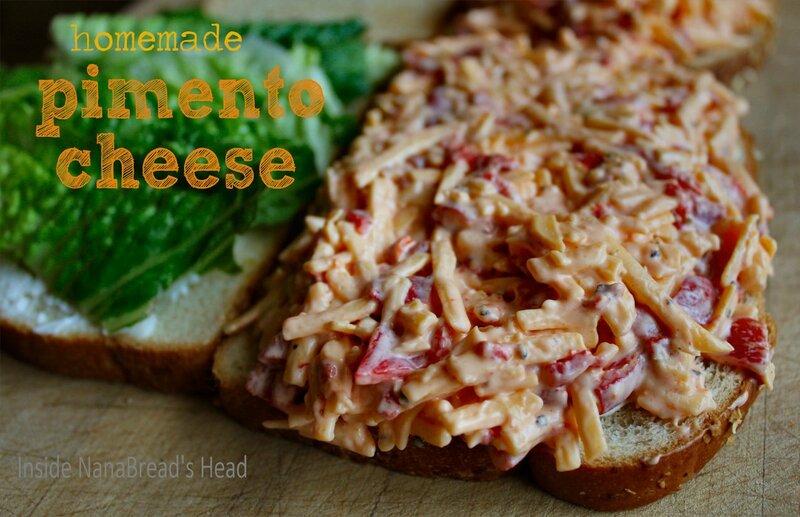 I never thought of making my own pimento cheese spread – what a great idea. Looks delish! You have to try it! Homemade is so much better than the store bought stuff, it should almost have a different name. If you start with great ingredients (and those piquillo peppers) this will knock your socks off. You may never buy it in a tub again. Mmmmm…cheese…. I haven’t had pimento cheese since I was little. Yummy! Whaaat?? Never had pimento cheese? Well, Anne… you have to try it! It might just become your new favorite. PS – extra pickles are a must!